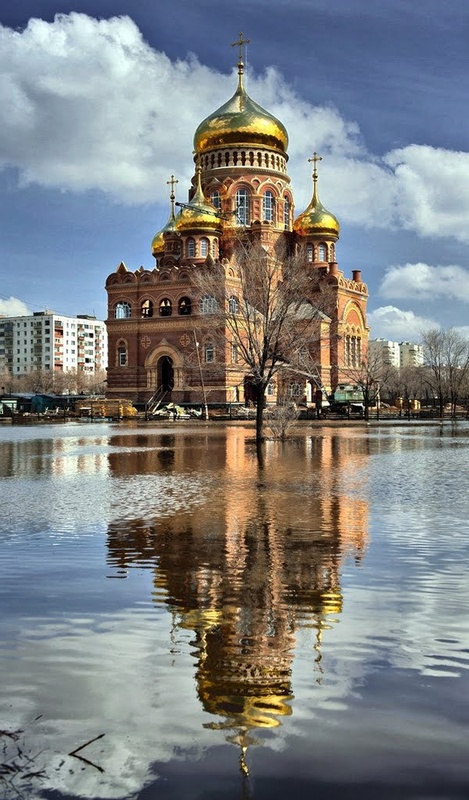 Orenburg is a transcontinental city and the administrative center of Orenburg Oblast, Russia, located on the Ural River 1,478 kilometers (918 mi) southeast of Moscow, very close to the border with Kazakhstan. Population: 548,331 (2010 Census); 549,361 (2002 Census); 546,501 (1989 Census). The Russian Empire began plans for the expansion into Asia by construction of an eastern frontier fortress town in the southern Ural region to be named Orenburg in 1734. The colonists originally founded a settlement in 1735 at the confluence of the Ural River with the Or River. The town's name meant "fortress near the Or," as Burg is German for fortress. This settlement changed its name in 1739 to Orsk. An attempt was made to found another Orenburg about 175 kilometers (109 mi) west at a location called Krasnogor, or "Red Hill," in 1741, but this settlement failed. A third Orenburg was successfully established by Ivan Neplyuyev at its present location approximately 250 kilometers (160 mi) west down the Ural from Orsk in 1743. This third Orenburg functioned as an important military outpost on the frontier with the nomadic Kazakhs. It became the center for the Orenburg Cossacks.